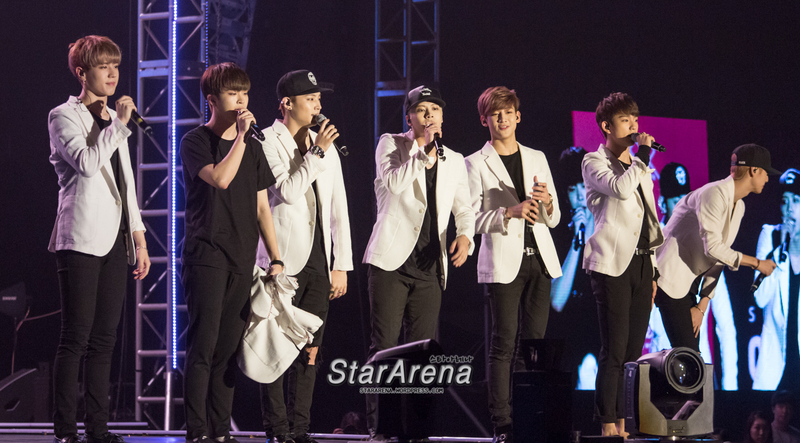 Singapore, 2015 – Good news for Monsta X fans and SISTAR fans in Singapore! 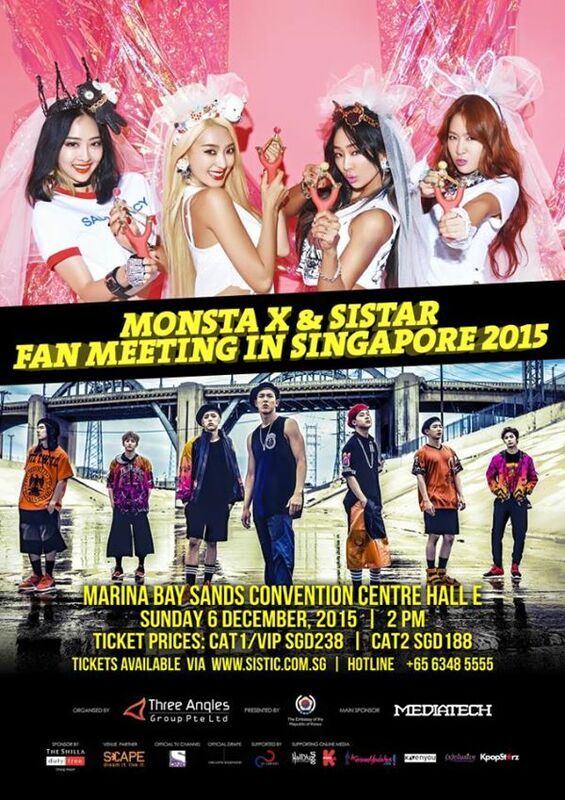 Three Angles Production, have officially updated and announced that ‘Monsta X & SISTAR Fan Meeting in Singapore 2015’ would be on 6th December 2015, 2.00pm at Marina Bay Sands Expo and Convention Centre Hall E. Cat 1 VIP tickets would be launched at SCAPE Orchard on 25th October, 12pm to 5pm, with each person entitled to purchase a maximum of 4 tickets. Cat 1 VIP ticket holders will also obtain a passes to high touch with Monsta X and to take a group photo with SISTAR (25 fans per photo). Cat 2 tickets would be available through all SISTC platforms on 30th October 2015 from 12pm onwards. There will only be 1500 seats available for this fan meet. Number of Tickets Per Pax: Each Person is entitled to purchase a maximum of 4 tickets at the ticket launch at SCAPE. High Touch: All Cat 1 Ticket Holders will be entitled to a High Touch Pass with Monsta X. Photo Pass: All Cat 1 Ticket Holders will be entitled to a photo pass (25 fans per photo) with Sistar. *Please note that tickets are sold on a first come first serve basis and while stock lasts. Sales Platforms: Tickets will be available via all Sistic platforms (Online, Hotline, Mobile Apps & Sistic Counters). Do follow the Three Angles Production on facebook and twitter for the latest updates and news on this upcoming Fan Meet in Singapore. South Korea – ‘SGC Super Live 9th Fashion Show and Concert’, organised by Seoul Girls Collection, was held successfully on 6th September 2015 at Ilsan KINTEX. This fashion show and concert, which lasted for approximately 3.5 hours attracted a large crowd and attention from fans and media. It included showcases of numerous collections and also performances of artistes such as GOT7, Wonder Girls, EXID, G-Friend, Monsta X, Pocket Girls and Kye Bum Zu. There was also live streaming of the fashion show and concert, provided for many overseas viewers who were unable to attend this event in person. Not long ago, Seoul Girls Collection, has also announced ‘SGC Super Live’ World Tour in Manila, Bangkok and Singapore respectively. If you live in these countries, or is interested in going for any of these upcoming events, do stay tuned to their Facebook for more updates and details! For more photos, do visit https://www.flickr.com/photos/stararena/albums. Photos by: Quek Y. S.
We would like to thank Seoul Girls Collection for the invitation to this event.